Professional service company is one of the few companies offering an in-depth full service company with expertise in design, installation, maintenance and monitoring. 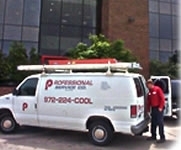 Another benefit is that Professional Service Company services both building control systems and HVAC systems. Therefore we are able to solve problems normally passed from one company to another. Professional Service Company is a SERVICE COMPANY FIRST. Meaning we will be there to service your control system even after the installation has been completed. Professional Service Company has taken over service of numerous control systems due to our Great Service! Are their controls backward compatible? Will they sell you the entire software, including programming software with licensing? How quick will the system become obsolete? Can the control system be added onto as the needs increase? What is the age of the current controllers that will operate the latest software? Are they experenced in Air conditioning systems, including the type of system they will be controlling. How will Air Conditioning service and control service communicate. Professional Service Company is now pleased to add the installation and service Distech building automation Systems. This system is based on lonworks technology. This Is a open system which allows endless control with out the Brand Locked Proprietary systems. The Open Systems Alliance Program (OSA) brings together leading solution providers, manufacturers, integrators, resellers, and other companies dedicated to solving business problems involving open networks of everyday devices. OSA Authorized Network Integrators can help plan and deploy device networks in your facilities. OSA members are available worldwide and provide services across a wide array of industries. Solidyne's IZAV Control & Monitoring System software makes arranging your input and outputs fast and easy. With the ICMS Network Information Manager, you can maintain your system by computer. Learn more about how this works. Up to 1,000 IZAC controllers per network! See a graphic representation of the features.